Drawing basic forms will help you see correctly. As you look at an object, no matter how complicated it may seem, the first step is to reduce it to its basic shape. 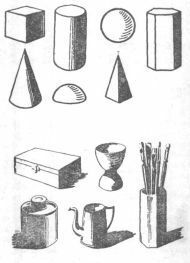 Once this "seeing" of the shape is established, you will be able to draw the object correctly. Does that make sense? Basic shapes, forms or "models" are cubes, cylinders, spheres, hexagons, cones, hemispheres, and pyramids. <>Draw these shapes on paper for practice sake.... But, more importantly, try to observe your sorroundings and identify the basic shapes on the objects you observe. It is only a short step to recognition of the basic forms when sketching from nature... and then to the human head and figure!